Let’s create with Cocoa Vanilla Studio Card Making with You Rock Collection. First of all, for those who don’t know much about Cocoa Vanilla Studio, it is an Australian brand. Designed by Zoe Pearn in New South Wales. Although the products are made in China because we all like cheaper scrapbooking supplies, I think Zoe’s products are high in quality and the paper is lovely and thick (similar to Simple Stories and Echo Park). Further more the collections are not limited to paper but have matching die cuts, stickers and those cute little enamel dots/shapes which are rather hard to pass up on!! For those who may not know me I have 2 boys 10 and 7 so when I saw You Rock I immediately had to order it because I knew I would love crafting with this collection. I have made 5 cards using the You Rock Collection. While i was shopping, there were also die cuts from two previous collections, Made of Awesome and Totally Rad. What I totally saw and loved is the die cuts would match with the current collection. 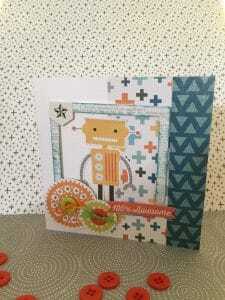 Therefore, just like Doodlebug Designs it is easily adaptable because the die cuts can be used over a number of collections. So using the 12×12 You Rock Collection Kit and the Totally Rad die cuts, i’ve put together 5 cards. Ive also added in some buttons, coloured twine and some mists to make these cards come alive! When I make my cards I like to have an idea of where my card is going to end up because I don’t want to end in a mess. From there I can create with what i have got. One of my favourite ways is to use Card Maps. Beck Fleck is one of my all time favourites as you may know. I used her January 2018 card maps. You can find them HERE . This is a great way to speed up the card making process and spend less time moving embellishments and paper around not knowing really what the final card will look like. Some times I also like to sketch my own out as well. You can find my first card maps HERE to download for free. Next I spread out my papers and embellishments and simply cut and paste away! This collection is all about bright, fun and funky and for those who know me that is totally my style! Adding foam tape and buttons gives the cards added dimension. My next creative task is to create some cards using the same You Rock Papers, but using another collection, perhaps the die cuts to Made by Awesome. If you’ve enjoyed this blog today please leave some love! I’m certainly open to ideas on what you’d like to see more of as well on my blog! Maybe a step by step project, more 3D cards or something else that will inspire you to craft! Doodlebug Design Milk & Cookies has just arrived in store! Some of you may have watched my Live facebook video a while ago on the new Doodlebug Design Milk and Cookies Christmas range for 2017. If you didn't and would like to, you can find it here. The video is about an hour long if you can brave it. In this video I said that I would post my finished cards on my blog. I based these cards around the simple card maps I had drawn for myself. A list of the products used will be at the end of this post and linked to my website so you can go shopping if you like what you see! I like to keep my cards clean and simple, with not much fuss and adding a few embellishments. My favourite embellishments to use are buttons, sequins, epoxy dots and paper string. Giving myself card maps helps me to establish boundaries and allows me to create quickly. This is great when you need to make cards to sell or have limited time on your hands. The Buttons and sequins used were in my personal stash but watch out as i will be adding these items soon to my store! Finally, I know you all like a FREEBIE. The Card Maps I have used are all on a printable page for you to use when making cards. Please don't copy the page for others but share the link to the page to spread the love. You can find the card map page HERE. Chameleon Art Pens A Review. Last week I got my first order of Chameleon Pens into the store, so I though I’d give you a little insight as to what I think about the pens..both the Pro’s and Con’s of course! I have been a Copic lover for around 3 years now and absolutely love using them! The Chameleon pens are probably the closest I have come across to being like a Copic Marker…however it does not replace the Copic!. I love the Chameleon pens for their juicy nibs, the brush tip is more like a paint brush and the nibs seem to let quite a bit of ink out which makes it feel like you are painting rather than colouring. The other feature I love is that it comes with a bullet and brush nib..not like the Copic that has the chisel end! (I never use that end!). Having the bullet tip means you can work in small areas easier and it writes really nice. Like the Copic Marker the nibs and inks are replaceable and in terms of cost, pretty well much of a muchness. I like the fact you can get several shades from the one Chameleon pen, making blending really easy from light to dark. Thinking about being a first timer wanting to try out alcohol markers, I actually think I would have gone for the Chameleon pens if they were around…..why you ask? The outlay is less. It is $150 for 20 pens and a blender and detail pen…making one pen approx $7 worth. This pen gives you approx 10 different colour shades in the one pen, because of the use of it’s own blender attached to the pen. So in Copic language I would need approx 3-4 Copic markers (maybe more) to get the same effect the Chameleon pen does. A Copic is approx RRP $9 for a Ciao..so that means you would have to pay somewhere near $30-$40 for the entire blending colour range of 1 $7 Chameleon Pen. The instructions and information that come in the 22 Set and on the Chameleon website is an awesome resource, giving you lots of inspiration and ideas on how to use your pens! The instructional videos are clear and well thought out to guide you through how to colour with the pens. Now to some Con’s…I don’t like the fact that there is only 2o colours (hopefully they will come out with some more)..it seems a little limited…but in saying that the colours given are a great variety of bright and basic colours (which is great for a beginner). You can also layer the colours on top of each other to get new colours which also gives some interesting effects and new colours. You can’t FULLY control the blending shade….It has taken a bit of practice to work out how long to fuse the marker with the blender to get the same shade. It also is a little time consuming…usually I would have 3 Copic markers open in my hand that i can swap. With the fuse system waiting for 15-20 secs (sometimes longer and sometimes shorter) seems to take forever. Using the markers is pretty straight forward, and I certainly will be using mine. In particular when travelling in the car (my hubby hates me taking Copics with me as i need so many!). The Chameleon Pen will certainly stop my colouring in cravings while i am away! As a beginner, this is a great way to start, to see if you like using them…If you do you can always invest in Copics later, and the best thing is the Chameleon Pens are designed to blend with any alcohol marker which means they won’t go to waste! I hope you’ve enjoyed reading my review on these pens! P.S A few days later i did a live broadcast on Periscope using these colour tone pens…you can check the video out on You Tube! A quick little project to share with you! A quick and easy stationery Set! Our local school, that my boys attend are having a fundraising night tomorrow. They wanted local business’ to contribute for a raffle. Realising I was short on time I got stuck into a quick and easy stationery set. This is the quickest and easiest project ever! Firstly you will need a piece of boxboard about 600 – 1200 um. Cut it to the size you want. This Set I cut the box board 10.5 inches x 4 inches. When you cut it measure your cards and envelopes you want to use and make it fraction bigger.I was originally going to go for a 6×4 card but changed my mind after i made the cover. Leaving about an inch around the outside so your cards and envelopes don’t stick out. You will also want to leave an extra 1/2 inch on the longer side for the middle fold. Don’t forget to double the horizontal or long side so you can make the cover. Score your 2 lines 1/2 inch apart in middle using your scor board. Next I found some patterned paper in my stash. It is an old 3 bugs in a rug paper collection. I wanted basic and birthday theme and this matched perfect. I then measured my paper I chose for the cover and added on 1/2 inch on each side so i could cover the edges neatly. I scored the paper 1/2 inch from each side and again measured the 2 lines at 1/2 inch in the middle. Next step is to cover the box board with your patterned paper. I used x press it tape to stick it but you can use glue. Next is to cover the inside. I used a co ordinating colour and measured the paper out with 1/2″ less than the box board I cut out on all sides (so 1 inch less each side altogether). Measured with the scor board 1/2″ lines in middle. I stuck that with tape to the centre. (before doing that I added some photo corners, but you don’t need to)Decorate the front as you see fit..you could add perhaps a ribbon or twine to keep it closed as well if you like. I then took my cards and decorated them very simply with a stamped “happy birthday” and some Doodlebug Glitter sprinkles.I made 5 for this set. Next I measured a piece of matching Kaisercraft cardstock about 2/12″ wide and 8″ long to fit around my envelopes and cards. I placed the cards in the middle of the strip and measured where the sides ended and scored 2 lines 1/4″ apart so the cards would fit in nicely. I then stuck the two outside sections onto the inside of the chipboard covered section so I would be able to fit the cards in. I repeated using the same method for the envelopes, only scoring 2 lines on either side about 1/8 apart. I then added some Doodlebug Washi Tape along the card stock to decorate! Bingo! A cute little stationery set for our raffle! You may also like to add a pen inside as well down the middle, and you can use any theme you like for your cards. It would make a great gift for anyone! It was about 10pm yesterday and i’d been trying to get a quick video together all day with not much luck until now! So here it is, in my 10pm thoughts :). I thought I’d introduce and give you a quick demo on the new Kirarina pens that have become available on the Australian market. They are made by Copic and are popular amongst the Japanese girls for writing and doodling. I’ve been playing with them for a week or so now and really loving them! The 2win marker is a perfect fit for planner addicts as they don’t bleed through thin paper (eeeek i hear you say! Love Love Love that!). The other things I love about the markers is they smell nice…yes I wish you could smell the berry and the melon YUM!. They also have a highlighter as well as writing pen! Even better the highlighter is lighter than the writing side!. The Wink is a lovely pen as well…writes great on photos (forgot to mention that in video) and doodles/writes lovely on black card stock, with plenty of shades to choose from! made by Copic means these products are acid free which we all love being scrapbookers/planners/cardmakers! So take a look at my video and see the markers for yourself (please excuse the thread jar and box on the left..I must get a proper stand :)) If you have any questions please feel free to comment and I will attempt to answer them! Lest we forget on this ANZAC DAY 2015…..Hubby and my eldest attended an ANZAC day service in our local town while I stayed at home snuggled in bed with my youngest. It’s so cold here at the moment and it’s not even winter yet! I had to get into my craft room and put some brightness back into my day! I knew exactly what i wanted to use and that was the new Doodlebug Design Collection Sunkissed. I love this collection for all it’s summer time themes and the colours are so bright and cheerful! I thought I’d make some Shaker Cards to add to the fun..Shaker cards are a lot of fun to make and add something unique to the front of a card or a project life page. For the first card, I used the Sweet Stamp shop Beach Bum Stamp Set and stamped lots of the beach balls and sand buckets and spades, and a sandcastle onto X press it Blending card and coloured in with my Copics. I then cut a template for the stripes from a scrap piece of card stock, traced and then cut again using the stripes paper from the 6×6 Sunkissed paper pad. Next I adhered some acetate to the back of the paper, placed some foam tape around the edges of the template so the sandcastle, beach balls and buckets didn’t fall out when i placed them into each open stripe. I finished the card off by sticking the small polka dot paper onto the tape to hold the bits and pieces in and matted using the blue paper. I added some Enamel dots, paper twine and a stamp to finish it off. So much fun seeing the balls and the buckets sliding around when you shake the card! The next card I made I used some Nesting Circles and scollop circles to cut out my circles and scolloped border. Using the same technique of acetate, foam tape and some card stock on the back, I added some colourful sequins to the middle. Finishing the card with a Sunshine from the Sunkissed icons Sticker sheet, a few enamel dots and the same stamp. I love the noise this makes when you shake it around! I have started working on some project Life pages as well Using the Sunkissed Collection, which i hope i can share with you soon! Below is a list of all the things i used to make my cards. Click on the time to find it in my store! Thanks for stopping by today and checking out my project! Leave a little love below and I’d love to see your shaker cards! Post them on Instagram and tag me in your post, or share them on my Facebook page for me to see and i will share your card! I wanted to share a project I have been working on for about 8 weeks now. I used the kaisercraft Shine Bright Collection. As soon as I saw it I knew I wanted to work with it but couldn’t see it fitting in with my Project life nor cards so I decided to make a mini album. I used the Shine Bright 61/2″ Paper pad, matching collectables, captured moment cards, epoxy dots and paper tape (I’ve listed and linked them all at the bottom if you want to purchase or look further). I made the album to the design from Kaisercraft Licorice card stock and then cut and glued the paper and embellishments over. Next time I make an album I’ll change it a little now I’ve made the original to make it a little more my own design. I thought it was a bit hard to explain in photo form the album in great detail so I made a video as well, which you can watch. I hope you enjoyed this project and it inspires you to make a mini album! I love making them! You could also use Kaisercraft Pocket Stickers as well. Thanks so much for dropping past! I am such a huge Aussie fan of Sweet Stamp Shop Stamps and have been supporting the company since almost the beginning! I am so excited to be apart of the Re-Opening Design showcase of their new release for April and their new website! Please checkout the other designers that were involved and the new website HERE! I decided to give my Silhouette Cameo a cut and made this cute little tea dispenser! If you’d like to see more of my work and keep in touch with the latest products from Sweet Stamp Shop be sure to check out and become a fan of my Facebook page HERE , and subscribe to my blog via email! The most asked question I get from new customers is “I’d love to start card making, but how do I start?”. Well if you are this person, read on and discover my best 5 Card Making tips for Beginners. The World of Card making tools seems to be endless! From scissors and trimmers to manual and electronic die cutting machines. There is a tool for literally everything. However if you are just starting out and don’t have a large budget then the following is what i’d recommend to start. A Trimmer is probably the most needed card making tool. There are three main types of trimmers you can use. A basic trimmer and blade such as the Couture Creations Paper Trimmer . The blades on these are replaceable and it’s easy to use. A Rotary Trimmer (Fiskars is a well known brand) is just as easy to use. The blades are replaceable and last a little longer (but is a fraction more expensive). Lastly the Guillotine Trimmer, the most expensive of them all and the down side is the blade isn’t replaceable in most but it allows you to cut thicker materials. With what you’ll cut to make cards the basic blade or rotary blade will do. Next a good pair or two of scissors. Make sure the scissors you buy are sharp and also comfortable to use. I love the Kaisercraft Craft Scissors for general cutting and the Kaisercraft Precision Scissors for smaller “fussy” paper cutting. The other tools that come in handy are a set of tweezers for small embellishments, a Paper Creaser for creasing your base cards, a steel ruler and craft knife. When it comes to adhesives you need a few but all will serve a purpose and be on hand in time of need. A double sided adhesive tape such as the Couture Creations 12mm Double Sided Adhesive Tape is a great all purpose tape size. Double sided tape usually comes in widths 3mm, 6mm, 12mm and higher but personally i find the 12mm one best as you can cut to size, but the entire width is great for sticking a large piece of pattern paper onto your card base. Experiment with the sizes and see which one best suits you. Double Sided Foam tape is a fantastic way of adding 3D dimension to your cards to help make them pop. Foam tape usually comes in 6mm and 12mm and i find the 12mm foam tape the best all rounder for use on my cards. A strong glue such as Helmers 450 Glue is useful for gluing buttons, ribbon and other hard embellishments to your card so they don’t fall off. The Zig squeeze and roll is useful for small embellishments such as sequins or delicate die cuts that are difficult to stick down with double sided tape. Card stock usually comes in an approximately 230gsm weight and 12″ x 12″ size. A good starting point is to have a variety of colours on hand. Having a variety helps you choose and match the right colour with your pattern papers. I find the Kaisercraft Weave Card stock a great choice. It is well priced, good quality and a good weight. For Card bases you can buy basic rectangles and squares in packs of 5, 10, 50 or more. They can be anywhere between 240 gsm and 300 gsm in weight. Once you get a bit more adventurous and find single card bases easy to create, try other card technique bases. Check out my Pinterest board for ideas. To get your handmade cards looking co ordinated in colour is to start with a collection of papers and embellishments. 6″x 6″ Paper pads are good value for money and a time saver as you don’t have to cut them too much. You usually get approximately 24 double sided (better value) or single sided 6″x 6″ papers in a pack. The size of paper means the images are smaller which are perfect to fit on a card base. There are numerous companies that make 6″ x 6″ paper pads and matching embellishments, it is just a matter about choosing your style. Doodlebug Design is one of my favourite companies for 6″ x 6″ paper pads and matching embelishments. Alternatively many scrapbooking and card making business’ have their own style made into a card kit. Kits can have anything from 1 – 10 cards. Kits contain matching papers, embellishments and instructions or ready made card photos to help you create your cards. They are a really easy way to start if you are unsure of your style or you are worried how to even start creating. Check out my kits here as a starting point. As discussed above many embellishments come in collections. However you can find many embellishments that are made seperately and therefore offer more choice on your card. Embellishments such as sprinkles or epoxy dots, sequins and buttons can be bought in packs. Buying a variety pack means you can keep on hand and match with your card as you please. Try to keep the colours basic and neutral. Try not to buy with a pattern on them as this makes it harder to match. As you continue on your card making journey you will find what embellishments you use more. Therefore try not to buy too many of one sort to start with because you dont want to end up with a collection you will no longer use. Now you have your tools, papers, card stock and embellishments you are ready to begin creating your first card. I hear you ask “How do i do that?”. The best way to start is to head to Pinterest for ideas or perhaps Card Maps. One of my favourite card map designers is Becky Fleck. The PDF pages of approximately 6 card maps certainly help you get ideas for your card designs. Try to keep your cards simple to start with until you find out what style you enjoy and can easily co ordinate colours. There are techniques such as stamping and mixed media which you can try out later once you have achieved the basics of putting a card together with embelishments. Finally making cards is meant to be fun! If you find you are not getting anywhere step away from your project and come back to it! Try different ways of placing your papers on your card base, try different card shapes until you find your style. Enjoy and be your kind of creation!